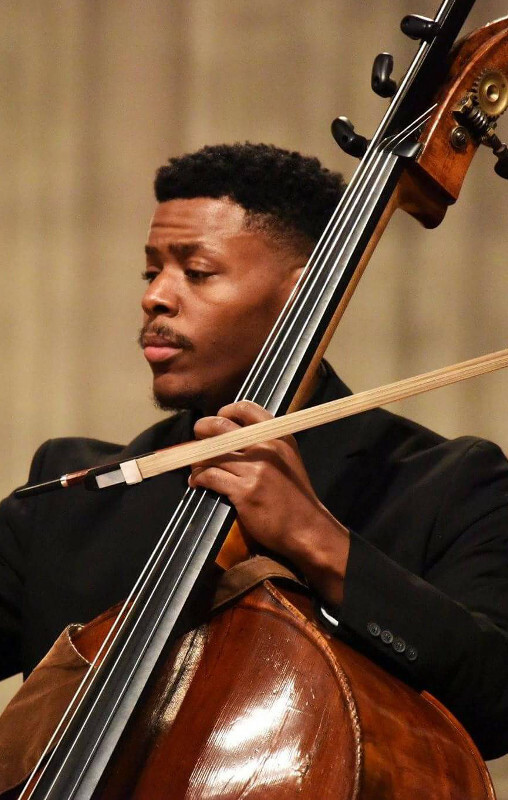 Congratulations to Ian Saunders ('09 B.M., '12 M.M.-double bass), who is the recipient of a Cincinnati Conservatory of Music/Cincinnati Symphony Orchestra (CCM/CSO) diversity fellowship position. This program allows musicians from underrepresented populations the opportunity to participate in a specialized two-year course of study that is already garnering attention among leaders throughout the music world. The educational opportunities consist of frequent performances with the Cincinnati Symphony Orchestra, focused mentorship by professional CSO musicians, and simultaneous enrollment in a master’s or artist diploma degree program at the Cincinnati Conervatory of Music. The four-year pilot program, funded by the Andrew W. Mellon Foundation, will graduate two classes of up to five fellows each through June 2019. A multi-faceted musician, Ian enjoys an exciting career as a sought-after bassist and educator. The Virginia native began his studies with principal bassist of the Virginia Symphony, Christopher White. He completed his bachelor’s degree under the tutelage of Robert Nairn at Penn State, where he took part in several world premieres by Finnish composer Teppo Hauto-Aho. Saunders continued his graduate studies under Nairn while participating in numerous professional engagements with the Williamsport Symphony, Penn’s Woods Festival Orchestra, Ballet Theatre of Central PA, and Manassas Ballet Theatre. In addition, he served as principal bassist of the Penn Centre Orchestra, Nittany Valley Symphony, and Altoona Symphony. In 2016, Ian received his doctorate from the University of Maryland, studying with Robert Oppelt, principal of the National Symphony Orchestra. He is currently in high demand within the competitive Baltimore and DC freelance community, most notably as the bassist for the critically acclaimed Post-Classical Ensemble. In March 2016, he was featured on WBJC 91.5 Baltimore, performing Guillaume Connesson’s Sextuor. He has played engagements abroad in Canada, Mexico, and the Bahamas as well as across America in renowned concert halls including the Kennedy Center, Heinz Hall, and Carnegie Hall. Outside of the classical world, Ian has been invited to participate in orchestras backing Bootsy Collins, Kansas, and hip-hop artist Thee Phantom. He can also be seen in the nationally televised special Cherish the Ladies: An Irish Homecoming, backing the Irish supergroup Cherish the Ladies. The program was nationally syndicated on PBS in 2013. As an educator, Ian has served as interim double bass teacher at Penn State, and has taught classes at the University of Maryland, Juniata College, and St. Mary’s College of Maryland. He spends his summers as the associate dean of students at the Eastern Music Festival in Greensboro, NC.